Why become a sponsor of AngelRide? See below for Sponsorship Level details and specifics about each sponsorship item. While the marking of the route will be by arrows on the pavement, there will also be lawn-type signs used for caution areas, miles to rest stop or finish, and inspiration and encouragement. These signs will have the Hero sponsor’s logo in one of the four corners. The logo-sized stickers will be 4” X 4” in order to be visible for both cyclists as well as normal Saturday vehicle traffic. While the AngelRide organizers will order and affix the stickers to the signs, it will be up to the corporate sponsor to provide their corporate logo as a properly formatted JPEG file to AngelRide and to cover the cost of the stickers. AngelRide will prominently display one 4’ X 8’ banner and two 18” X 24” corrugated plastic lawn-type signs at the start of AngelRide. While the AngelRide organizers will order and prepare the banner and signs for display, it will be up to the corporate sponsor to provide their corporate logo as a properly formatted JPEG file to AngelRide and to cover the cost of the banner and signs. The approximate costs are Banner: $70.00 each and Signs: $40.00 each. AngelRide will prominently display one 4’ X 8’ banner and two 18” X 24” corrugated plastic lawn-type signs near the center of the outdoor entertainment Friday evening at Camp as well as at the Finish Gala near where the riders and volunteers congregate to eat, listen to the music, and relax with friends/family after a hard day of riding. While the AngelRide organizers will order and prepare the banner and signs for display, it will be up to the corporate sponsor to provide their corporate logo as a properly formatted JPEG file to AngelRide and to cover the cost of the banner and signs. For Hero level sponsors only: Since it is not possible for the AngelRide logistics team to get the banner and signs from the Start/Camp in Union, CT to the Finish in Mystic, CT before the first riders arrive two sets of Banners and Signs will be required with the approximate cost of two banners being $140 and four signs being $160.00. 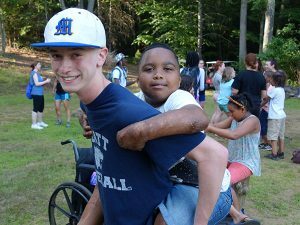 Being the only Burn Camp of its type in New England, the Camp is voluntarily staffed by first responders and medical staff. Appreciation will be expressed as an honorable mention of the Hero Sponsor(s) as either an announcement during the Friday evening dinner or by an announcement before the Friday evening entertainment. The representative from the Hero Corporate sponsor will be invited to briefly explain their involvement/interest in supporting the Camp and the children it serves. There will be an equal opportunity to verbally connect with the AngelRide Community to include medical personnel from the major burn centers in the Northeast as well as the first responders for whom the children’s welfare is a paramount part of their jobs. AngelRide will prominently display one 4’ X 8’ banner and two 18” X 24” corrugated plastic lawn-type signs near the food tables. A rider is required to stop and check-in at each rest stop and will generally spend 15-20 minutes resting, hydrating, and replenishing nourishment for the ride. While the AngelRide organizers will order and prepare the banner and signs for display, it will be up to the corporate sponsor to provide their corporate logo as a properly formatted JPEG file to AngelRide and to cover the cost of the banner and signs. The approximate costs are: Banner $70.00 each & Signs $40.00 each. The last mile of the ride, as the riders ride along beautiful River Road in Mystic, they get a great sense of accomplishment for a long hard day (65 miles) of riding for a great cause. This sponsorship opportunity captures this special moment with three 18” X 24” lawn signs; each crafted with a congratulatory message expressing the sponsors appreciation for their efforts. Each sign can have a different message and will contain wording mutually agreed upon by both the sponsor and the AngelRide management. Each sign will be alongside the road for high visibility. While the AngelRide organizers will order and prepare the signs for display, it will be up to the corporate sponsor to provide their corporate logo as a properly formatted JPEG file to AngelRide and to cover the cost of the three signs. The approximate cost of each sign will be $40.00. This sponsorship benefit includes naming two separate miles along the route (two corporate sponsor lawn signs) however, sponsors can purchase additional named miles to sponsor (other than the last mile) for an additional $250.00 each. While the AngelRide organizers will order and prepare the signs for display, it will be up to the corporate sponsor to provide their corporate logo as a properly formatted JPEG file to AngelRide and to cover the cost of the three signs. The approximate cost of each sign will be $40.00. The Wall of Honor is a wall of banners displayed along a fence at the Finish. The Wall of Honor receives an honorable mention which draws the attention of Riders, Volunteers, and their friends and family. While the AngelRide organizers will order and prepare the banner for display, it will be up to the corporate sponsor to provide their corporate logo as a properly formatted JPEG file to AngelRide and to cover the cost of the banner which is approximately $70.00. The corporate sponsor’s logo on the sponsor page of the CT Burns Care Foundation’s website. There will be no additional cost. The corporate sponsor’s logo on the sponsor page of the AngelRide web site. There will be no additional cost. The corporate sponsor’s logo on Facebook, Twitter and Instagram. There will be no additional cost. A brief interview opportunity with the corporate media sponsor at Camp or at the Finish expressing how the AngelRide integrates well with the sponsor’s corporate mission as it applies to the children. There will be no additional cost. Upon signing on to either the Hero, Camp & Finish or Start sponsorship levels, an e-mail announcement will be sent to the AngelRide Community (past and present riders, volunteers and donors; approximately 12,000 people). This entitles two people (non-riders or volunteers) from the Hero corporate sponsor(s) to attend a day at Camp (when in session) to see the joy that their support provides the children. This entitles two people (non-riders or volunteers) from the Hero corporate sponsor(s) to attend the Pre-AngelRide Friday night dinner and entertainment at Camp. A Matching Sponsor will field a corporate team of at least three riders (each of which will pay the $100 registration fee and raise the required $500.00 per rider) with the Matching Sponsor matching the total amount raised by the team. For example, The ABC Corporate Team fields three riders each of whom raises in excess of the minimum (say an average of $750.00 each) for a total of $2,250. The ABC Corporation will match their employees’ efforts by donating an additional $2,250.